In March 2015, Joe MacLaren, a state oil and gas inspector in Colorado, drove out to the Taylor 3 oil well near the tiny town of Hesperus, in the southwestern corner of the state. He found an entire checklist of violations. Atom Petroleum, a Texas-based company, had bought out more than 50 oil and gas wells after the company that drilled them went bankrupt. Now, Atom was pumping oil from those wells, but Taylor 3 was leaking crude, and it was missing required signage as well as screens on infrastructure to keep birds away from toxic gunk. Worse, the company had not performed safety tests to ensure the well wasn’t leaking fluids underground. Over the following months, the state slapped Atom with fines, performed follow-up inspections, and demanded a $360,000 bond to cover the cost of shutting down the wells, just in case Atom — hardly proving itself to operate in a trustworthy manner — didn’t clean up its act. Indeed, the list of violations MacLaren and others discovered kept growing, yet Atom kept on pumping oil and gas, and did not pay fines or put up the $360,000 bond. So in 2016, the state took a rare step: It revoked the company’s drilling permit. Atom’s business, it said, was no longer welcome in Colorado. Atom didn’t bother to follow through on one last important obligation either. When companies cease production, they are supposed to plug wells with cement to reduce the risk of leaks, and to restore vegetation and wildlife habitat aboveground. They recoup their bonds if they do so, whereas if they don’t, the state cashes them. In this case, Atom flouted its responsibility to plug and reclaim its wells, leaving the state to clean up its mess. Colorado did claim a $60,000 bond Atom posted when it first started operating, but the cleanup could cost taxpayers 10 times that. The 50 or so wells Atom left behind comprise Colorado’s largest-ever “orphaned well” case, according to the Colorado Oil and Gas Conservation Commission. But it’s not an isolated problem. Companies that go out of business, become bankrupt, or, like Atom, simply ignore the rules, tend to skip out on cleanup and land restoration. And since bond amounts set by states and the federal government rarely if ever cover real-world cleanup costs, it can be cheaper for a company to forfeit a bond than to follow reclamation rules. Orphaned wells are more likely than properly plugged “abandoned” wells to leak pollutants, including methane gas, which can contaminate groundwater and even trigger explosions. So it’s troubling that the number of such wells in the West has soared. 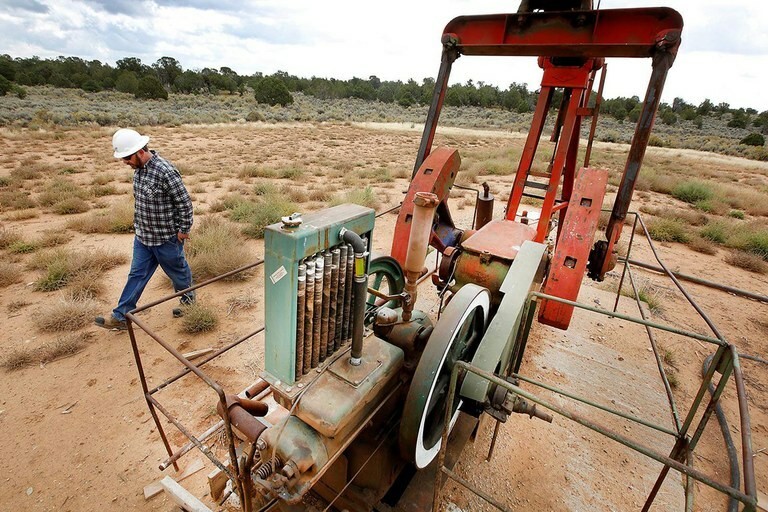 A downturn in energy prices starting back in 2008 has led energy companies to orphan thousands of wells across Colorado, New Mexico and Wyoming. States are struggling even to tally them, let alone remediate them. Officially, Colorado has 244 orphaned wells on its books, but state officials estimate another 400 have yet to be located. And with a new drilling boom tapping deep shale formations along Colorado’s urban Front Range, some worry that the next bust will saddle the public with thousands more. Steve Labowskie, the southwest field inspector and project manager for orphan wells with the Colorado Oil and Gas Conservation Commission, walks around an abandoned oil well in Redmesa, Colorado. There are 244 known orphan wells in the state. In Wyoming, the problem reached epidemic proportions. In 2014, under Republican Gov. Matt Mead, the state implemented an aggressive strategy to identify and plug orphan wells. To hedge against future busts, the state also significantly hiked the bonds companies must put up before drilling. It based those increases partly on well depth, since the deeper shale oil and gas wells now being targeted are much more expensive to reclaim than conventional shallow wells. Wyoming has since reclaimed 1,700 sites on state and private lands, using taxes and royalties paid by industry to chip away at the backlog caused by the spike in orphaned wells and insufficient bond funds. But it has also identified nearly 4,600 more orphaned wells — and that’s just on state and private lands. “Wyoming is more ahead of the game than other states,” says Jill Morrison, director of the Sheridan-based Powder River Basin Resource Council. Even so, the state “can’t keep up,” she says, and the higher bond rates still don't fully cover reclamation costs when a company orphans its wells. Reclamation on federal lands in Wyoming, where there are thousands of additional orphaned wells, has been even slower. This August, Colorado Gov. John Hickenlooper proposed several tougher rules for monitoring and reclaiming both orphaned and properly plugged wells. The announcement followed a deadly house explosion in a north Denver suburb last April, which elevated concern about all kinds of oil and gas infrastructure since it was caused by a severed methane gas flow line mistakenly attached to a previously idled well that had been made active again. Hickenlooper’s reforms included creating a fund that would be used to eliminate the state’s orphaned-well backlog within a decade. It would be bankrolled by energy companies, possibly through a property-tax increase, and could also pay for services like in-home methane monitors for neighborhoods that are next to or even on top of old wells. Tracee Bentley, executive director of the Colorado Petroleum Council, acknowledges the need to “get ahead of a potential problem,” but questions whether new taxes are the solution. Instead, she says, the state could direct existing tax revenues to the issue, or create a voluntary program for companies to help plug and reclaim wells. In Oklahoma, for instance, companies can choose to divert 1 cent for every $100 of oil and gas they produce to a program that restores orphaned wells. The state claims that 95 percent of operators participate and the program has restored 16,000 well sites since 1994. State Rep. Mike Foote, a Boulder County Democrat, says he would like to see higher bond rates in Colorado, but he doesn’t expect much cooperation from state Republicans. In a letter to the Colorado Oil and Gas Conservation Commission, two state GOP leaders expressed concern over Hickenlooper’s proposal for an orphan-well fund and disagreed with his portrayal of the issue as a “vast” problem. But without more money and regulatory muscle, Foote says, the state is not just ducking the current problem; it’s inviting future calamity. Since the deadly Denver house explosion last spring, watchdogs have documented an alarming number of poorly monitored abandoned wells and flow lines beneath Front Range communities. Some of this potentially perilous infrastructure lies directly beneath neighborhoods. With several small companies, some already cited for violations, currently drilling and applying to drill for oil and gas in Boulder and neighboring counties, Foote and others fear the next price crash could create a hazardous landscape rife with orphaned wells. And dealing with those wells could be even more complicated than before, because industry is now tapping deep shale formations, where wells are much more difficult and expensive to plug, reclaim, and inspect. Note: This article has been updated to correct a statement that inaccurately attributed last April’s deadly explosion to a flow line connected to a plugged – not a temporarily idled – well.